Hansen Building kits provide pressure treated wood for all components that will make ground contact. Before you make that investment in a new pole building you deserve some answers about the treatment process, the different types of treatment methods out there and data showing how long properly treated poles will last. Lets first take how treating poles is done. The process begins with a large freight car of dry lumber, timbers or plywood. The car is then moved into a treating cylinder where the door is then sealsed and air is removed from the system. Removing the air allows the treatment solution to better penetrate the wood. At this point preservative fluid is then filled into the secured tank. Once pressurized to 150 pounds per square inch, the fluid is forced into the wood. The time it takes for the treatment process varies depending on the wood species and the retention level required for that particular bundle of wood. Once the wood has retained as much preservative as possible the tank is drained and excess fluid is stored for future use. Before the cars are removed there is a final vacuum process to remove any excess fluid from the wood. They then open the cylinder doors to remove the newly treated wood and allow it to dry. To see how the treatment process is done watch the educational video below. Micronized Copper Azole (MCA): Most commonly used treatment method for treated poles, timbers and skirt boards. This offers the highest protection agains rot, decay and termites for a variety of residential, commercial and agricultural building applications. Considered the most environment friendly option of all treatment methods. Copper Azole (CA): Another safe treatment solution but not as common as the MCA method. A water based wood preservative that presents fungal decay and insect attacks. Alkaline Copper Quat (ACQ): Replaced CCA methods but recently has been used less as it is very corrosive to metal fasterners and panel products. Creosote Treatment: Commonly used for utility poles and railroad ties, Creosote treatments are only allowed for commercial uses. Chromated Copper Arsenate (CCA): Where available CCA is used for non-residential and some marine uses. The treatment process typically used on poles and skirt boards of your Hansen Building kit is commonly MCA with a some locations using CA treated lumber. 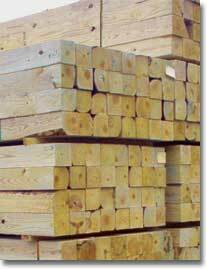 The American Wood Preserver’s Association has twelve different levels of pressure treatment. Hansen Buildings requires all treated roof load bearing materials to be at a level of UC-4B retention or higher. UC-4B treatment is a grade designed to be buried underground for use in building foundations. Some competitors will use materials treated to a lower standard and this is important in comparing the quality of your building and making an educated buying decision. You can confirm the grade of any treated wood by reading the sticker or stamping on the treated wood product. There have been a variety of tests on the different types of treating process in the last 50 years. Because the MCA treating process is so new we will show you how older treatments have faired and compare the MCA treating to the CCA treatment process that was popular over 50 years ago to arrive at a conclusion of the expected service life of MCA treated lumber. The USDA Forest Products Laboratory published a study in June of 1981 of two stake tests that took place in Mississippi and Wisconsin. In the study they used 2 by 4 inch stakes of southern pine sapwood treated with CCA retention levels of .26 which is significantly lower treatment levels than required for in ground use today. At the time of this study the stakes were in test for over 30 years and no failures had occurred in the test stakes with treatment levels above .29. In the study it says ‘Since there have been no failures in stakes treated at retentions comparable to those used in wood foundations, firm predictions of service life for these stakes cannot be made, but prior experience with other preservatives leads us to conclude that these stakes will last substantially longer.” This study can be viewed at Preservative-Treated Wood for Foundations. ACQ was the next major treatment method that started becoming commonly used in the early 90’s due to the restrictions placed on CCA treated lumber. Because of high levels of copper, ACQ treated poles are five times more corrosive to steel and was the major reason it is used much less today. ACQ is accepted throughout the industry as well performing wood treatment very similar to the quality of CCA treated lumber. In December of 2006 Universal Forest Products released a technical bulletin to show test results of Micronized Copper Quaternary(MCQ) treated lumber and Alkaline Copper Quaternary (ACQ) Since the MCA treatment process is so new they could not wait 20 years to determine if the MCQ and ACQ treatment process was effective. The test was run by setting three different sized stakes into two separate locations in coastal regions of Gainesville, FL and Hilo, HI. Known for the harsh conditions in these two locations, it was determined these tests would provide an accurate accelerated results due to the harsh nature of the site. After different site visits over time the results show the MCQ method outperforming the ACQ treatment methods. Untreated stakes were at failure levels by the time of the second visit, showing just how hard on wood this site really is. The details of this stake test can be seen: MCQ/ACQ Stake Test Bulletin. These tests were conducted using stakes that were treated with a .40 MCA treatment level – with similar treatment levels used in all Hansen Building treated poles and skirt boards. azole dispersed in water. This preservative provides superior performance. As a result of all these tests on the various treatment types it displays that all types will provide protection against rot that will outlast the life of the building. For other reasons mentioned the MCA treatment process is the most beneficial. If you have further questions regarding treated poles that would be used on your building please contact a building designer at 1-866-200-9657 today.